This article is about the character. For the guest star, see Betty White. "If you watch even one second of PBS and don't contribute, you're a thief. A common thief!" Betty White is an American actress best known for her role as Rose Nylund on The Golden Girls. Betty White hosted a PBS pledge drive, telling viewers that they were thieves if they watched the programs but didn't contribute. Homer Simpson, driven by guilt and by having his favorite program, Do Shut Up, interrupted too often, called in and pledged $10,000 so PBS would get back to showing the program. Homer didn't leave his name, but the PBS Pledge Enforcement Team tracked him down and made him go to his bank to withdraw the money. 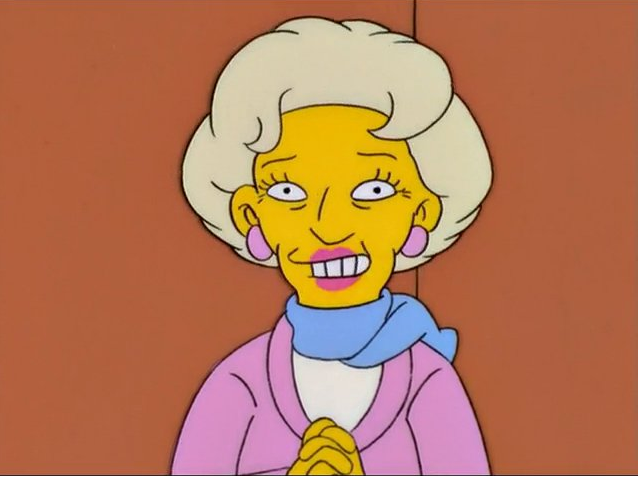 When things didn't go well at the bank, Betty White got Homer to confess that he didn't have the money and had made a fake pledge. She then sicced a mob of PBS characters on him, among them the Do Shut Up hooligans, the Teletubbies and several Muppet characters from Sesame Street. When Homer had a job as a paparazzi photographer, he took Betty White's picture outside a dry cleaning shop. Based on his experiences photographing other celebrities, Homer had come to expect the celebrities to be unfriendly and snobbish and have no idea who he was (if they even cared). Betty White, however, was pleasant and friendly to Homer, greeted him by name, and didn't object at all to his taking her picture. She even gave Homer a self-addressed stamped envelope so he could send one of the pictures to her, and told him she would sign it and send it back to him. Modified on July 27, 2017, at 17:54.